When it comes to Windows applications, it’s easier to demonstrate how they work as a video instead of wasting hours on explaining things with a text. 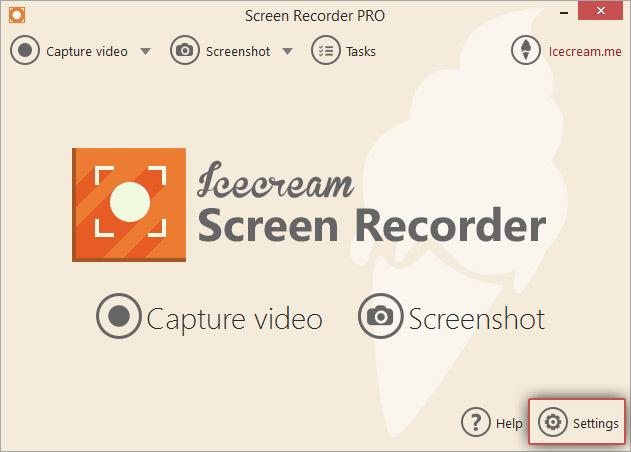 Icecream Screen Recorder lets the users record on-screen activities that are performed on their computer and record Windows applications for making video tutorials. Read more about the abilities of this program in the article below. 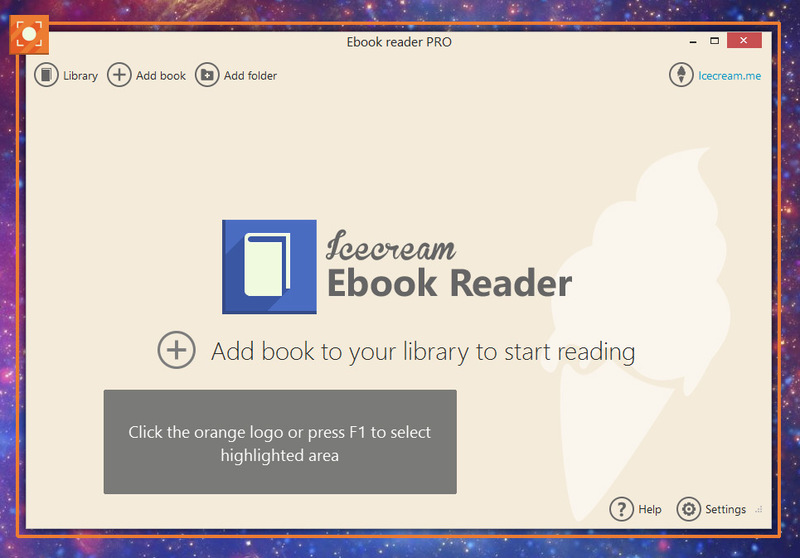 Users can download Icecream Screen Recorder from our website. Just press the “Download” button, save the installation file on your PC, and open it to complete the setup according to the Installation Wizard’s guidelines. When the program is installed, open it and get ready to record Windows applications. Click the “Settings” button in the bottom right corner of the program's main window to open the Settings panel of the screen recorder. All the settings available in the program are sorted into 5 tabs: System, Save to, Video, Audio and Hotkeys. You can read how to customize these settings before the screen recording here: How to Change Recording Settings. 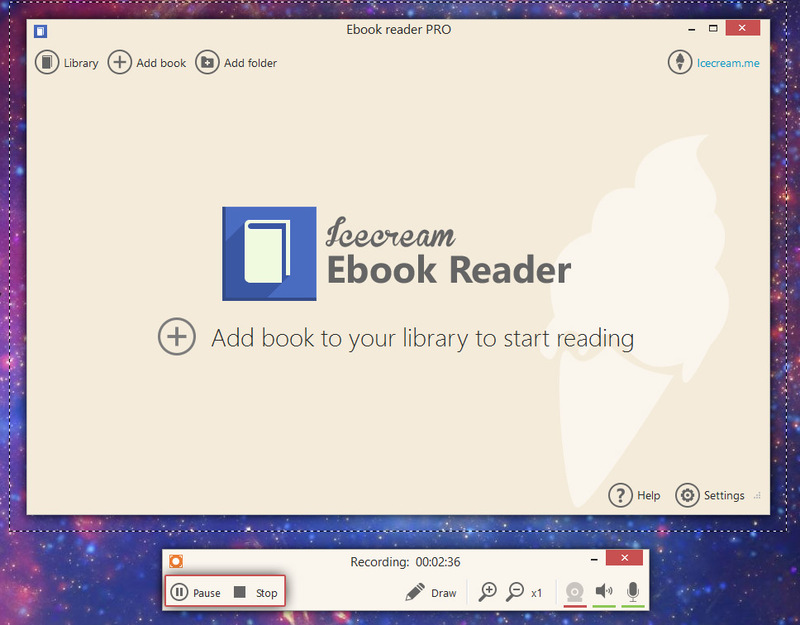 Open the Windows application that you want to record. 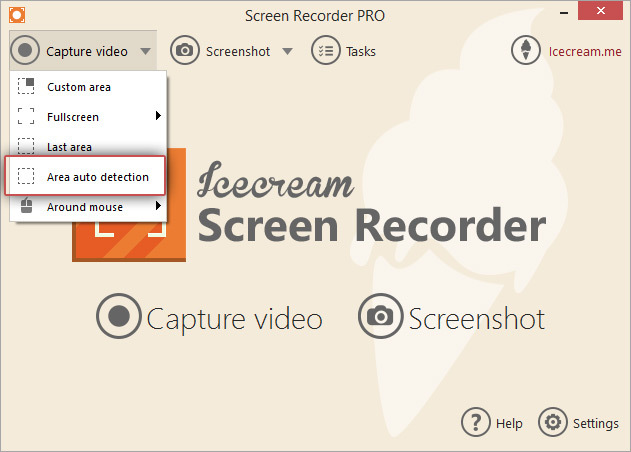 Click the “Capture video” button in the upper left corner of the Icecream Screen Recorder's main window and select the “Area auto detection” option from the drop-down list of the available recording modes of the program. We recommend using this mode since it helps to automatically detect the area of the Windows program you'd like to record. Next thing to do in this mode is place the mouse over the application to be captured to let the program frame its borders. Press F1 keyboard button or click the program's logo to select the area to be recorded. After that, all the buttons and icons on your desktop become inactive, but the “Switch” button on the recording panel will switch the control back to your desktop, folders, programs, etc. (note that if the “Hide desktop icons” option was enabled earlier in the Video tab of the Settings panel of this screen recording software, all the icons will be hidden from your desktop). 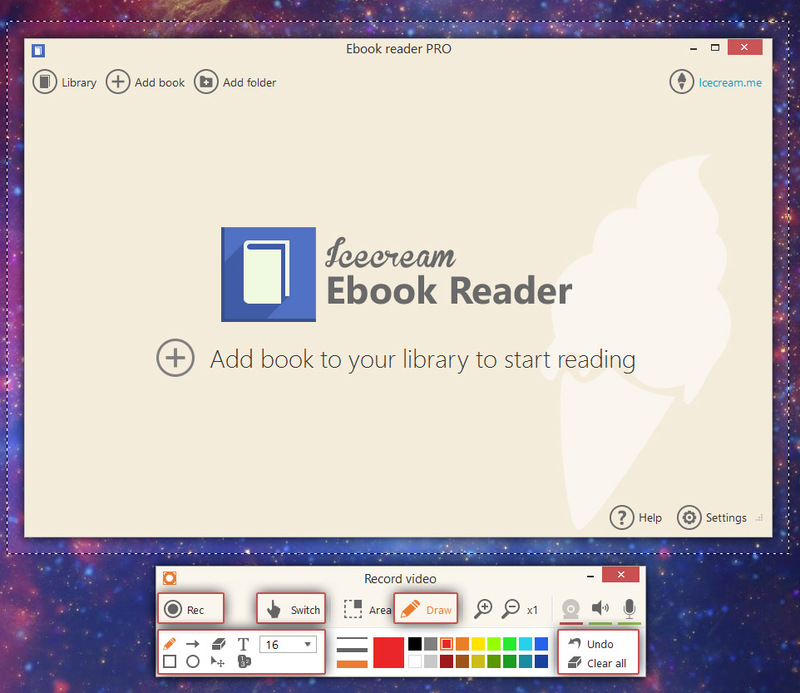 The “Draw” button opens the drawing panel with a set of drawing tools like brush, rectangle, arrow, oval and step tool. These tools can be used throughout the recording process to make the video more expressive and comment on the process. You can select color and thickness of these graphic tools on the drawing panel as well. The “T” icon stands for text and offers typing of whatever you want whiles recording Windows applications within the recording area. It’s possible to choose font size and color. After that, simply click where you want to type your text and start typing. To cancel the changes, press the “Undo” button in the right-hand side of the panel. The “Clear all” button removes all the applied changes. Click the “Rec” button on the recording panel of the screen capture software. If you checked the “Show countdown” box in the Video tab of the Settings panel earlier, recording will be preceded with the countdown. Note that all the controls are available during the entire process, which means that it’s still possible to draw or type on the screen while recording. All the changes will be shown in the output video in the same order that they were made. The “Pause/Resume” button helps pause the process to make some corrections or skip certain parts of the process you are recording (like long lasting loading or file processing). Once you are ready to finish the recording session, press the “Stop” button. It will automatically save the file to the folder specified in Save to tab of the program's Settings panel (“Save video to” option). You will see a notification in the bottom right corner of the screen (unless you disabled the “Show notification” option in System tab of the Settings panel of the screen recorder) – click the folder icon or the file's name to open the file in the containing folder. Alternatively, close the recording panel panel and click the folder icon in the Path column in the History panel of the program. 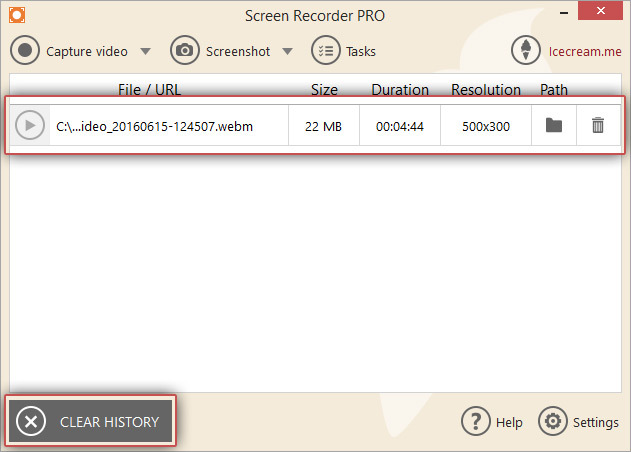 Users can find all the videos recorded with Icecream Screen Recorder in the History panel of the program. Press the “CLEAR HISTORY” button in the bottom left corner to clear the history, or click a recycle bin icon to the right of a file to delete a single video from the list.